DUBAI, United Arab Emirates, April 16, 2019 /PRNewswire/ -- Zurich Middle East ('Zurich') has released its 2019 Customer Benefits Paid Report, based on claims insights from January 2016 to December 2018. The report highlights the key health risks in the region and why the time to take up life insurance is now. 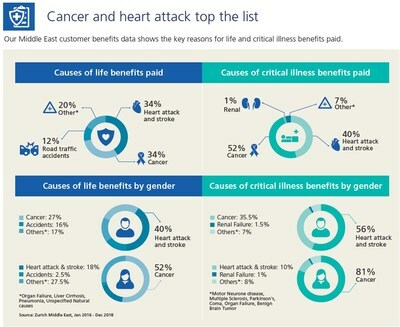 Cancer (47%) and heart attack (38%) remain the top two health concerns in the Middle East for both life and critical illness claimants. Cancer is the primary cause of critical illness benefits paid to women (81%) while heart attack is the primary cause of critical illness claims from men (56%). Accidents are among the primary causes of death among men in the UAE, Bahrain and Qatar (12%). Against the backdrop of the Middle East's relatively young population, health eventualities are occurring at a relatively young age. The average age of Zurich customers claiming critical illness benefit is 48 years, while life claimants are aged 50, highlighting the need for early protection and preventative measures. Zurich Middle East has paid out USD 102 million (AED 375 million) in customer benefits over the past three years, a 27.5% increase compared to the previous period. There is a prevalence of health risks within the region and they are occurring at an increasing rate. As this reflects the growing importance of protection, the right amount of cover must be considered. Many claimants are underinsured, as 88% of customers who suffered a critical illness had coverage of USD200,000/AED735,000 or less. With critical illness claimants being only 50 years on average, this amount is not enough to cover key needs such as family income replacement and post-operative care expenses, highlighting the importance of having adequate levels of financial protection at the outset. "As the region remains underpenetrated, it is key for insurance providers to take ownership to raise attention, and build consideration about the prevalent health risks in the region," says Walter Jopp, CEO of Zurich Middle East. "Financial protection is paramount, particularly in a region like the Middle East with a significant proportion of working families with dependents. The financial impact must be considered if the key income earners are unable to work." "Our role at Zurich is to make people in the region aware of these facts. It's also important for us to listen to our customers, share their claims stories and create solutions and services based on their needs. Our website, social media and blog content emphasise the importance of both protection and prevention as we are passionate to spread this important message to our community." "You can rely on Zurich to honour our customer commitment. Zurich continues to be the only life insurance provider in the Middle East to issue yearly claims statistics specific to the region. We are proud to report that we paid out 93% of life cover customer benefits and 94% of critical illness customer benefits. At Zurich Middle East, we have been committed to the cause of helping our customers protecting their financial futures and being Ready For Life for over 30 years." No one knows what the future holds, but with adequate protection in place one can be better prepared to deal with the unexpected. Consider the health risks, seek advice from a financial professional and make a well-informed decision about the protection needs. Empower to be Ready For Life. One can't predict the future, but can protect it. Chyira is a Zurich Middle East customer, mother, wife, cancer survivor, and now a thriver: "You get up every morning and think you get another day – let me make the best use of it. Spend more time with family and those you love because you don't know what tomorrow will bring." Watch as Chyira shares her inspiring story. Zurich's 2019 Customer Benefits Paid Report is a must read for all people residing in the Middle East. About Zurich International Life Limited is a part of Zurich Insurance Group and fully authorised under the Isle of Man Insurance Act 2008 and is regulated by the Isle of Man Financial Services Authority, which ensures the company has sound and professional management and provision has been made to protect plan holders. Zurich International Life Limited in the Middle East is registered in Bahrain under Commercial Registration No. 17444, is licensed as an Overseas Insurance Firm – Life Insurance by the Central Bank of Bahrain and in Qatar authorised by the Qatar Financial Centre Regulatory Authority (Registration no. 00067). In the UAE it is registered (Registration No. 63) under UAE Federal Law Number 6 of 2007, and its activities in the UAE are governed by such law.